Here’s an attractive homemade gift that should appeal to anyone who sews, crochets…or those of you who like fast and easy glue gun projects. These are so simple and easy to make, you’ll be able to whip up matching pairs in no time, whether you make your own potholders or use a purchased set. Either way, these practical little pouches make great eye glass holders or scissor holders! I used the Amber Waves Afghan Square pattern, by Priscilla Hewitt, to make the crocheted pot holder shown here, but you can use your favorite crochet pot holder with fabulous results. At the end of your pattern, before fastening off, chain 12 and slip stitch in first ch, fasten off. Weave in ends. Lastly, with loop at the top, in a triangle shape, fold in both sides. Complete with a whip stitch, starting at the bottom and end at the top of the two corners. Fasten off. Weave in ends. Glue on a decorative button on the center. 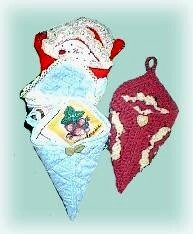 I made one with the design on the outside, and another one with the back side of the potholder forming the face of the pouch. If making one with the design on the outside, glue the lace on the design side, around the hem of the top two edges (see diagram). Let dry. Hold the pot holder with the loop on the side, as shown in the diagram. Bring in the two sides to meet in the middle, overlapping the hem edge of one side over the other side. Run a bead of glue along this overlapping edge, from the point bottom to the top corners and glue down. Use the diagram and photos to help visualize these instructions. Let dry and glue on a decorative button. Enjoy!